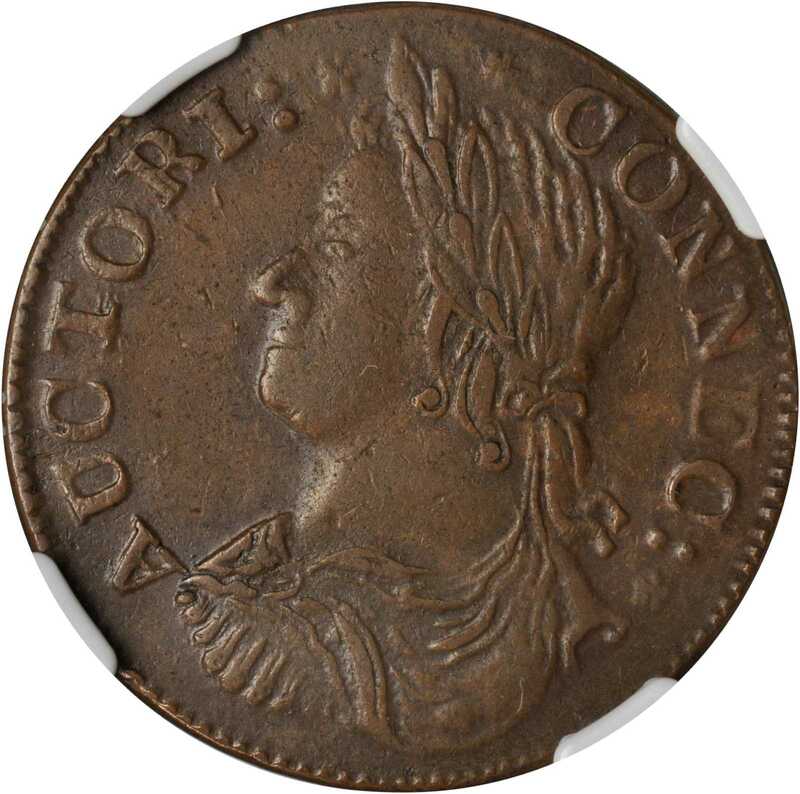 1786 Connecticut Copper. Miller 7-K, W-2695. Rarity-7. Draped Bust Left. AU-58 (NGC).149.7 grains. A simply stunning example of this very rare variety and likely the finest known. The surfaces are lovely medium chocolate brown with only a few tiny scattered marks and a light spot at Liberty’s bust, noted for accuracy. Glossy and nicely struck on a good quality planchet without any serious fissures or laminations. Though there is just a trace of roughness near Liberty’s feet, it is of minimal consequence. The strike is even, allowing for well-balanced definition throughout, and well centered, allowing for complete execution of all letters of the legend. Only the bases of the date digits rest upon the rim. White painted attribution numbers on the edge are believed to have been applied by Dr. Thomas Hall.pWhen Michael Hodder wrote the description for the George Perkins coin, sold in January 2000, he was unaware of this specimen and identified that piece (formerly Frederick Taylor’s best of two!) as the finest available, ranking the Canfield specimen in the ANS Collection the finest. This piece compares very favorably to the ANS coin, as it has far better centering, a nicer planchet and better surfaces. It could be argued that the ANS coin has slightly better central detail, this being from nuances of strike rather than from any consideration of wear. One important feature of this coin is that it is available. An absolutely lovely coin with an outstanding provenance and the distinction of being the Sylvester Crosby plate coin. Added to this is the high degree of rarity and the desirability of the Draped Bust variant among type collectors. This piece has it all.From the Twin Leaf Collection of Connecticut & Massachusetts Coppers. Earlier ex Dr. Thomas Hall; Virgil M. Brand; Burdette G. Johnson; Eric P. Newman, Heritage, Newman Part IV, May 2014:30074.